Since feats for different categories of weapons are not officially published yet (only in Unearthed Arcana), I don't see why people are choosing Greataxe over Greatsword, except for flavor or availability (found enchanted Greataxe). Mechanically, is there advantage of using Greataxe instead of Greatsword? While Netzach makes a very good point, I'd like to add in the die dynamics. Although the average is very similar the two situations behave very differently. All numbers have an equal chance of occurring (a uniform distribution), thus your chance of a 12 is 1 in 12. Only one quarter of your rolls will be a 6,7, or 8. And on a crit, 24 is 1 in 144. You have a better chance of rolling higher than average, but also a higher chance of rolling lower than average. Many would argue that this balances out. But when you are in a battle and need a 12, your chances are better with the axe. Some prefer the Greatsword because the high chance of average damage is "slow but steady". Others accept the risk of a low roll with the Great Axe in order to have a better chance at high damage. The Greatsword is a better weapon than the Greataxe unless you are playing a Barbarian. 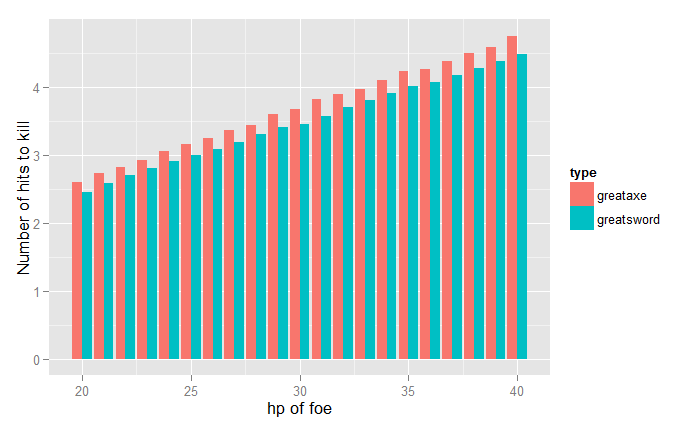 The Greatsword has two big benefits: (1) it has a higher average, and (2) it has a tighter and less random distribution. For classes that can take Great Weapon Fighting, it has an additional edge in the dice re-roll mechanics since each die can be re-rolled on a 1 or a 2. The second of these points is often misunderstood. It is common for people to wrongly believe that the randomness "balances out" so that it's simply a matter of taste whether you prefer. This is wrong. Randomness counts against the player in the long run and, unlike monsters who appear, die and are never seen again, players are around long enough for the long run to count. The reason for this is simple: low rolls count against you more than high rolls count for you. HPs done in damage over a monsters' hitpoint total are wasted while a blow that fails to fall a monster means they stand for another hit, maybe round. So, in summary, the Greatsword is simply a better weapon. There is no reasonable trade off to be have with high risk, high reward. The Greataxe is just worse. It is only if you have Barbarian-style abilities that boost the Greataxe more than the Sword that it is a better choice. Other than the high risk/high reward nature of the Greataxe, explained in ravery's answer, the Greatsword is usually the better option. Mechanically, there are some ways to take advantage of the inherently higher damage die of the Greataxe though. A Barbarian's 9th level ability, Brutal Critical lets him roll one additional weapon damage die, on top of the normal extra dice gained from a critical hit. At higher levels this bonus increases to two and eventually three extra dice. The Half-Orc race has the Savage Attacks trait that gives a similar effect in allowing you to roll one your weapon's damage die one additional time when getting a critical hit with a melee weapon. To make an example of how this would actually play out, I'll use the Barbarian's ability. As you can see, the average damage of the Greataxe exceeds that of the Greatsword and at higher levels the difference is significant. Now, a Half-Orc Barbarian that can consistently score critical hits would be a thing to see. The problem is that this advantage that the Greataxe has over the Greatsword, only comes into play when a Barbarian and/or Half-Orc rolls a critical hit. A critical hit is rare on its own and for the Greataxe to outperform the Greatsword, you need a specific class/race. On the other hand, as you mention, the Greatsword has a higher minimum damage, slightly higher and thus more reliable average damage and benefits more from Great Weapon Fighting, making it more preferable under most circumstances. As mentioned in Netzach's answer, a barbarian's brutal critical is better when used with a 1d12 weapon instead of a 2d6 weapon. However, he doesn't account for the probability of a critical hit. 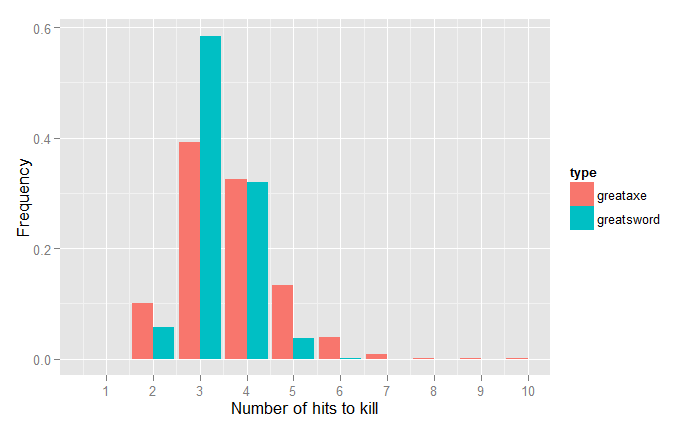 Therefore, I wanted to provide a calculation whether a barbarian actually has a higher average damage when using a 1d12 weapon, compared to a 2d6 weapon, and if so, at which barbarian level. I will be assuming that rolls of 8 and lower (leaving 12 other possible results) don't hit at all. The calculations with Reckless Attack were done using probabilities taken from this website, using the "Dice Roll String" 2d12D1+8. 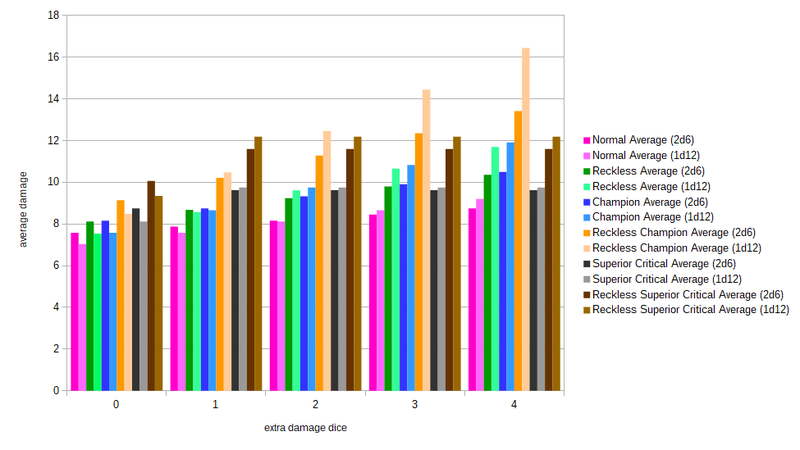 Note that the Superior Critical and Reckless Superior Critical bars are the same values for 1, 2, 3 or 4 extra damage dice, since Superior Critical cannot be combined with Brutal Critical due to the character cap at level 20. One extra damage dice is, however, possible by choosing the Half-Orc race. Not the answer you're looking for? Browse other questions tagged dnd-5e weapons optimization or ask your own question. Can you reroll both dice or only one when Great Weapon Fighting with a Greatsword? Can Goliath wield a Medium greatsword in one hand?